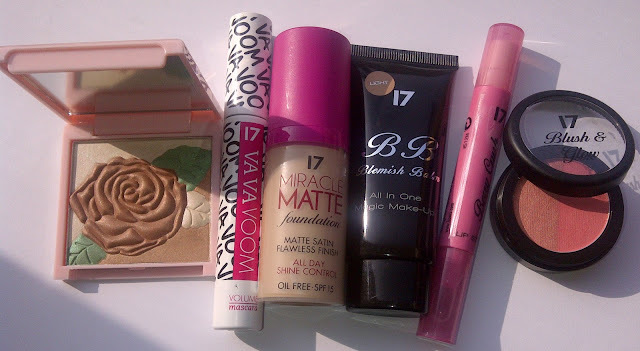 I was recently asked if I would like to take part in a bloggers beauty challenge to create a 'Spring Look' using the new limited edition Spring products from 17 Cosmetics. The winner will be chosen by 17’s makeup artist, Vanesa Guallar and be treated to an exclusive at home makeup masterclass with Vanesa for them and their friends, as well as being given two goody bags to give away to readers. I was sent a collection of products to choose from to create my look and after looking at what I was sent, I had an image in my head of how I would like to look this Spring. The products in the picture above were the ones needed to create this look. I think it really helped that today was the perfect Spring day to try out the look I was going for. I like to think of it as pretty but sophisticated, with the accent of colour and brightness on my lips but a pop of subtle shimmery colour on my eyes. I used the Blemish Balm to even out my skin tone and whilst it was quite fresh and dewy looking, I wanted something that would last all day and so opted to apply the Miracle Matte foundation for extra coverage where I needed it. Ordinarily I would always opt for a light dusting of bronzer all over my face with a bit of contouring just below my cheeks but for this look I wanted to keep it as fresh and pale as I possibly could. Using the gorgeous Spring Fling Palette in Hazy Days I gave my eyes the most beautiful wash of colour. 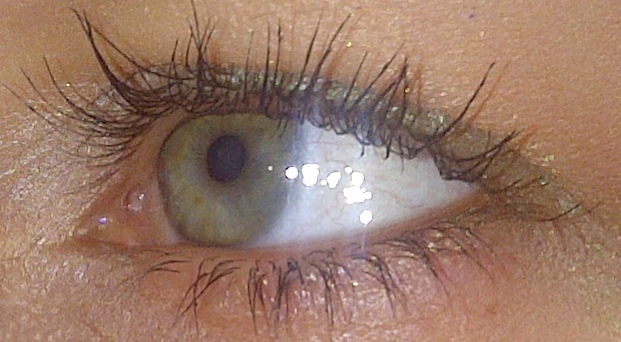 I used the palest creamy white shade all over the entire eye lid, then applied the green leaf which is a pretty pale green, pistachio shade with shimmer from half way and covered entire lid and took it out to the corners of my eye and just under the eye. I used the light bronze in the crease of my eye to create depth and warmth. I finished my eyes with a few strokes of the Va Va Voom black mascara for long, flirty lashes. I absolutely love the light green in the palette, I feel that it really picks up the green in my eyes and instantly brightens them, I will be recreating this look again. 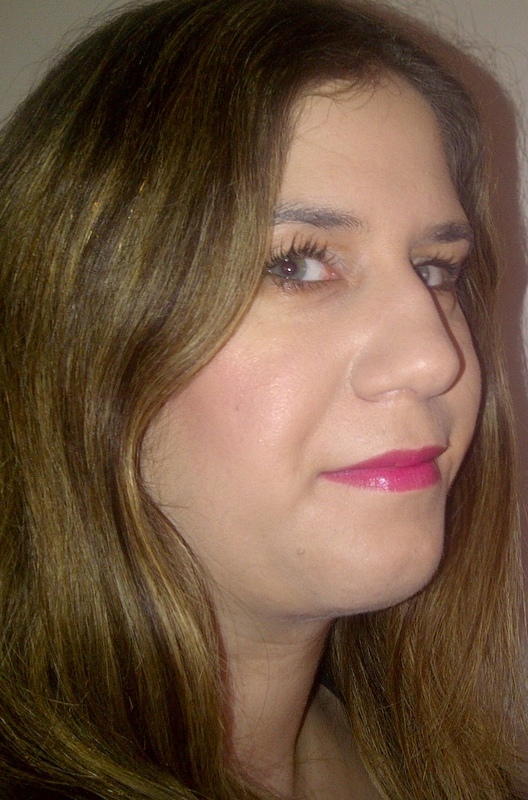 I used the gorgeous Blush and Glow peachy shade which in fact I found was quite pinky, the blusher has two halves - one side is the matte blush and the other has a shimmery, light bronzer. I swirled my brush into it all to get a very slight shimmer in my blush for a slight flush of colour. Using the Berry Crush Lip Stain pen I coloured my entire lips and then added extra shine with the Vitamin C enriched balm on the other end of the pen. All items are available to buy now at Boots except for the Lip Stain which will be on sale mid March. Very pretty lip colour, and the palette is so sweet! It really is so sweet! Fingers crossed for you Bettina! Such a pretty look. Your eyes are amazing - that close up is like something out of a magazine!